April 15, the traditional tax return deadline, falls on a Sunday this year. Then, the Monday after that, April 16, is Emancipation Day in Washington, D.C., so government offices are closed. So that leaves Tuesday, April 17 as Tax Day 2018. That day is almost here and that means freebies and discounts for all of us all over the USA. There are plenty of other food and drink freebies, just because — no purchase necessary! Just go out and visit one of these restaurants for free food or a discounted meal. After mailing in those taxes you’re going to need a relaxing tax day freebie like this free massage from HydroMassage. Contact your local HydroMassage for more details. There is no Staples coupon available yet this year. Bring in this Staples coupon and you’ll get up to two pounds of documents shredded for free. This offer is only available in store. Free shredding up to 5 lbs of documents with coupon through April 28, 2018. Get coupon from their website. From Saturday, April 14 – Saturday, April 21, members and non-members can use available HydroMassage chairs for some well-deserved (and free!) relaxation. Bring in a coupon available on their website starting April 14. During the whole month of April, you can enjoy $1 margaritas, known as the DOLLARITA™. It’s available all day every day at participating locations. After seeing how much you pay in taxes, this may be a welcome deal. See the details on their website. Participating restaurants (all of the freestanding locations not in malls) nationwide will offer a $10.40 Tax Day Special which includes a half chicken individual meal with two sides, cornbread and a regular fountain drink, while supplies last. Visit this bagel bakery from April 11-17 to purchase a Big Bagel Bundle (13 bagels of your choice and two tubs of cream cheese) for $10.40 with a downloadable coupon. Wash away all your tax day sorrows with a $5 Cuervo Blue Margarita, made with silver tequila, blue Curacao and pineapple juice. From Tuesday 4/17-Thursday 4/19, the children’s restaurant and playhouse will offer a free large cheese pizza with the purchase of any large regular-priced pizza. See, your family can still have some fun once the taxes are filed. Receive a free medium sub when you purchase any full price medium or large sub, chips and drink. Valid Tuesday, April 17 through Thursday, April 19. According to the company, you will need to present the offer that is usually posted on their Facebook page and e-mailed to people who have opted to get promotional emails from them. or download this coupon and take your friends to the sub chain. 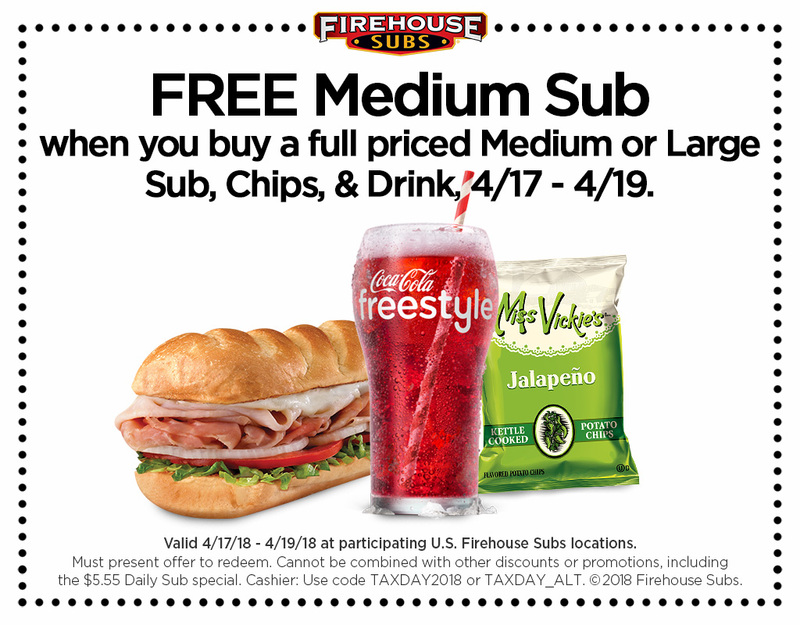 Order between Tuesday 4/17-Thursday 4/19, and receive a free medium sub with the purchase of any medium or large sub, chips, and a drink. The bakery wants to “share the fun of cookies” during such a gloomy time. Visit any of the participating stores on Tax Day and receive a free limited-edition cookies and cream cookie. Stick it to the man by eating for free. Visit the fast-food chain for a free original turkey dog or veggie dog on Tax Day. Because “there is no taxation without relaxation,” the shaved ice company has re-named Tax Day as National Chill Out Day. They’ll be passing out free shaved ice from their trucks on April 17. Too busy to sit down and eat in? Noodles is running it’s annual “File Online, Order Online” promotion from April 11-18, where you can use the code “TAXDAY18” on any online order to receive $4 off any $10 purchase. Potbelly Sandwich Shop is offering deals that will put some ease on your wallet. Customers who sign up for Potbelly Perks by downloading the Potbelly app (iPhone / Android) or online will receive a free sandwich. Those already enrolled in Potbelly Perks can enjoy a BOGO Sandwich that will automatically load in to the app for redemption on Tax Day (April 17). Quiznos is offering a 10.40 percent deduction off any purchase including catering, on April 17 to Toasty Points loyalty app members. Not a Toasty Points member yet? Download the app and sign up to be eligible for the discount and receive a free 4-inch sub when you download it. The fast-food sandwich chain is offering a free small original sandwich with the purchase of chips and a medium drink. America’s drive-in is back with their Tax Day deal. Take the whole family, or just stop in yourself for half-priced cheeseburgers all day. Don’t give up on the IRS just yet. As part of their Irresistible Rib Special, this BBQ chain is offering half-priced Sweet & Smokey or House Dry-Rubbed Ribbed dinners with two sidekicks and homemade bread. Kick away your tax day blues. Visit the chain from April 14 through April 17 and receive a free Kickin’ Shrimp appetizer with the purchase of an entrée.